When he first arrived, the area used to be relatively uninhabited. There were lots of empty properties and the council would give prospective tenants a few sets of keys and let them choose which they wanted. But towards the end of the nineties, the housing stock filled up. Now, people can wait up to a year to be housed. Saleh owns the building his shop occupies and business was very good up until a year or so ago. Recently however, his takings have halved. Saleh thinks this is partly to do with the recession and people being more careful, but also, there used to be 4 mini-markets around The Green and now there are 13, so there’s a lot less custom to go round. Most of Saleh’s trade is done on credit. Customers can accumulate up to £200 or £300 each and pay it off at the end of the month. He has a credit book in which he writes things down, but some of his customers just help themselves to what they need, (there’s a golf club in the shop, which is used to hook down boxes of cereal or rice from the upper shelves), then keep a note of what they owe themselves. 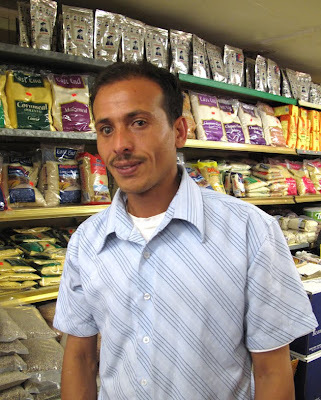 Occasionally, someone will ask for cigarettes or some Khat to chew and say they’ll come back with the money. He knows they probably won’t, but as it’s only a couple of quid, he’ll still give it to them to save a fuss. Most customers are local, but some come from afar. Occasionally they’ll even get Saudi Arabian students from Manchester driving over to Sheffield to eat in neighbouring restaurants, before stocking up on familiar flavours at Saleh’s. The language of the shop is primarily Arabic. If customers want something that he doesn’t stock, they will go elsewhere, but otherwise they are very loyal. When we asked why customers choose his shop rather than one of other 12, he replied: “I respect them and they respect me”. His friend agreed. “He’s been here the longest and he is trusted”. NB: As was the case with almost every shop we visited in Istanbul, Saleh hospitably offered us a drink during our conversation, and gave us a bottle of mineral water each.